A program designed to enhance honor and reciprocity in relationship. …rise up in our feminine power to restore peace in our hearts, our lives, and our world. Women are being asked to come together and lead. We are being asked to do the inner work to show up in the world. We are being asked to honor each other in relationship. We are being asked to step outside of the traps of comparison. We are being asked to stop distraction and overwhelm and become present. We are being asked to stop judgment, criticism, and blame. We are being asked to do all of this for ourselves, for our families, and for the world. From my perspective, as women we are already leaders, we already have power, and we have already risen up. We want peace in the world but we are struggling behind closed doors. We want to come together and lead together but most of us are leading alone. It’s time for us to speak to our hopes and despairs and challenges in a different kind of way. In a way that honors and respects one another and informs us of the ways we have gotten in our own way as well as the ways of each other. In a way that truly allows us to come together so that we can rise together. It requires a slowing down, a deep inquiry into how we listen, how we share, and how we exchange words. In order to change our lives and the world, we must change the way we listen, the way we share, and the way we exchange our words. It’s all about how we communicate and how we treat communication. In case we haven’t met, my name is Shauna. I love to communicate. It is one of the ways I thrive as a human. If you know me, you know that I am fully present in conversation, always looking for ways to help others grow. It helps me feel deeply connected to myself, my life, and the world. It wasn’t always this way; I used to be quiet and when I talked I didn’t share much of myself. I pretended everything was fine. I avoided hard conversations. I was afraid of hurting others and I was deeply afraid of conflict. You may wonder how I came into this work. I came to this work by way of my own journey with communication, specifically with my partner of over 20 years. (As you may imagine, we have had our fair share of conversations). My parents weren’t good role models. My mom and dad did not communicate well with each other. They would argue, my dad would leave and my mom wouldn’t talk to him for a week. I knew I wanted something different in my relationship. I knew I wanted honor and respect and I wanted to not only communicate but communicate well! Learning to effectively communicate is the very foundation of my long-term solid relationships. I’m a mother, a sister, a daughter, a friend, and a partner. All of which are very close supportive relationships. It has helped me rise as a leader and as a business owner. And most importantly, it has taught me the value of connection. I designed this course for women who desire to explore how communication, specifically our words, impacts our life and our world. It is for those already working in the spaces of personal and spiritual awareness and are committed to serving better and having greater impact. It is for women who desire to do the "real work". You will get to know yourself in a very deep way when you look at your communication. And you will move beyond the basics of being in relationship and develop ways to deepen into them. This course is an inquiry into how we use our words and how other use their words. It is challenging work because we will have honest and real conversations. And these conversations will transform us. Sisters, I believe in us. I believe in our capacity. And I believe it is our time. What is Sacred Communication about? Develop an easier time being present with your loved ones and yourself and enjoy the incredible depth and nourishment of connection. You will finally release the guilt of feeling busy and distracted. Experience more beauty, pleasure, and magic in your life because you are looking up in the world instead of being in judgement and self-criticism. Feel less overwhelmed and be able to slow down and be more effective and deliberate about your choices. Resolve unresolved issues in your business and personal relationships by learning how to face them with honesty, integrity, and grace. Feel a deep and steady sense of self-confidence and self-knowing. You will shift the way you relate to other people and end those traps of comparison and judgment and shame. Have a deeper experience of being seen, heard, appreciated, and understood because of your presence and how you show up in the world. This happens because we establish a healthy flow with honor and reciprocity. Feel the courage to communicate even when it’s deeply uncomfortable. Show up and share what is true even when you don’t want to. Understand the pain of others when you previously may have judged. Be more willing to feel your own pain and share it with others openly and honesty. Effectively communicate your boundaries with grace. Be willing to mess up and learn. Be willing to experience more intimacy, joy, and pleasure in your life. How do I give good feedback or how do I use my words for good? How do I exchange the words in a respectful and EFFECTIVE and also honest way? When do I let it go and move on and when do I hold others responsible? When is it worth it to really share how I feel? What is the best way to communicate what I am feeling and not hurt others in the process? How do I give good feedback to my clients to support their growth? How do I have a hard conversation with my partner so that they hear me? How do I speak so my words can be received by others? 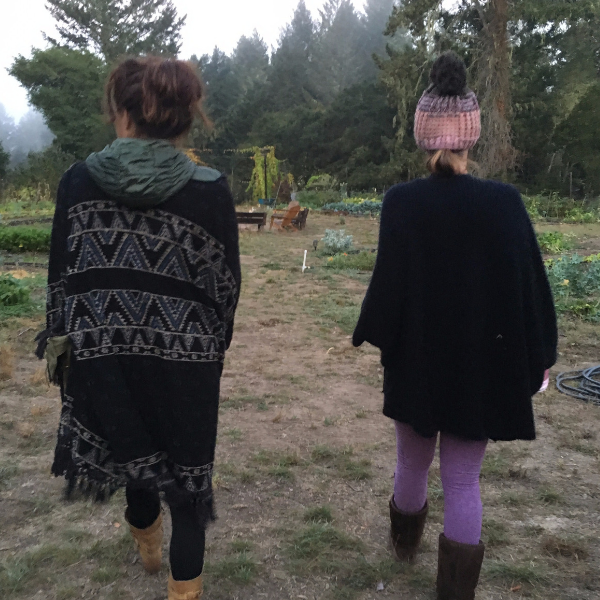 One of the best part of the program is…a weekend together in sisterhood on the earth! We will gather together here in California for one weekend in-person during our 6 month time together. We will explore the work around communication while being together. The event will include accommodations, food, workshops, and movement. Dates and exact place will be decided after the group is formed. Airfare is not included. Every month you and I will meet on the phone for one (1) hour to look at the ways where your communication or lack of communication is holding you back from deeply connecting with your life and the world. These calls have been the most valued part of the last two programs. They are filled with depth and transformation, of course laughter and some swear words in between. Twice per month we will meet live on the phone (conference style) as a group. On the first call, we will explore a sacred lesson around communication, which will be our focus and practice for the month. It will really be our exploration and journal time. Our second call will be all about sharing live in the group setting. We will practice sharing and being heard. We will practice giving and receiving feedback from all of our sisters. Each week you will practice the sacred lesson with another sister. There will be specific guidelines for the practice and sharing will be over voice memo. This part of the program is flexible and totally fun. And such a brilliant way to learn to communicate well. We will use Facebook as a way to connect in-between everything. It is a way to play with our words, share our insights and aha’s, get feedback from everyone and allow everyone to see us. Truly see us! It is a way to share all of ourselves so that we can feel confident and clear when we share outside of our sacred space. It also serves as a way to give feedback to others. It is our practice space. It will also hold all of our stuff, which makes things really easy for me and my team. There will be some surprises along the way. There always is. I am not sure what will come about this year. You will have to wait and see. I made this loving video for you...letting you know how Sacred Communication came to be and why I feel so grateful to be her guide and a little bit about what to expect. Working with Shauna has not only increased my awareness of how I show up for others it has helped me prioritize how I show up for myself. Her singular ability to reflect back to me my own journey without judgment or control gives me a valuable touchstone in my work to clarify my intent, my needs and my future. I am a better partner, parent, daughter, friend, colleague and me for having her in my life. In the past year I have grown so much in both my personal and professional life in ways I couldn’t have imagined. In the face of some significant personal challenges, I found myself better equipped to handle them in ways that didn’t involve burning out in the service of others but valuing the time I spent being present with those I care about. I am eternally grateful to the dear friend who suggested I take that first call with Shauna, and I look forward to our work together as I continue my journey. + What is a group program? It is a coaching program designed to do personal development in a group setting, with other women. It is important that you commit to the group as a whole because without one member the group is not full. We get to know each other really well and we learn from one another. If you are not a regular user of Facebook that it just fine; however, it is important to take time to connect with the group on a weekly basis. Being present is important. + do you give refunds? This program is an investment into your own growth and well-being. It is also an exchange for the commitment I put forth in this program. Therefore, refunds are not given at this time. + How will I access the calls/information? We meet over the phone, on Zoom, and Facebook. It is a combination of all three of these ways. There will also be a password protected web page that will hold all of our recordings and other important information. + What if I can't make a call? No problem, we know that life happens. All calls will be recorded and you will have access to them within hours after the call. It is important that you attend as many as possible as this is the best way to remain connected to the group and the work as a whole. + When will the retreat weekend be? The in-person weekend is one of the most valuable parts of the program. Everyone loves it. Therefore, we do our best to make sure the weekend works for everyone. It is a priority. There are always things that get in the way. Work, family, partners, etc. One of the things that we work with in this program, is teaching you to balance you and your life. One weekend away from everything is life-changing. + Where will the retreat weekend be? The in-person weekend is in CA. The exact location is yet to be decided. You are reponsible for flight and transporation to and from the airport. Accommodations, meals, and workshops will be taken care of for you. + I have another question? If you have a question that you don't see answered on this page, please email support@shaunalay.com and our Support Superwoman, Christle will respond. Hi love, sign up with your email address to receive writings and offerings.